I was looking at impact of slowdown in the IT/BPO sectors in the last few quarters in India and consequent drop in the market cap of these companies.Since both commercial(office) realty as well as residential realty demand depends on growth and expansion of BPO/IT businesses apart from other factors,there can be 'corrections'and may be drop in demand in both these segments.If Re-$ exchange rates continue to drop,there will be added pressure on IT companies. In the residential segments,pick- up in retail by end users in this festive season has been weak,and promoters are with unsold inventories/booking,delaying their fund deployment plans - this is true for North and the East.Last six months many of the promoters found large no of cancellations leading to refund pressures.Many top realty players are keeping on hold things like senior level recruitments and even land acquisition.Recent trend of many realty players diversifying to areas like telecom,education etc actually points out that there is slight drop in terms how they look at the long term potential of realty business vis-a-via what they have been making in the last few years. Many promoters blames stock market boom and Mr Chidambaram for the interest rate which has effected the sentiment of both endusers and investors. The sign of weaknesses are plenty and some of these are good for the industry.Steps like 'pay 15%,and pay EMI after possession'....are very good step to reach actual end users with 2/3 years of EMI holidays.These innovations are result of pressure in the market,and I donot see situation easing unless there is some drastic policy changes say like drop in interest rates.However there are still lot of opportunities to make money in real estate and big ticket investments should continue to follow from outside. There were two trading days that investors will take a long time to forget. Fears of recession in the US becoming a reality saw global indices tumble. 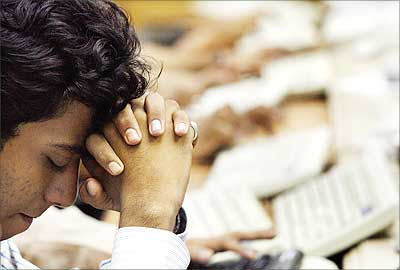 The worst to get affected in this mayhem was the Indian stock market. The bears went berserk on Dalal Street creating panic to such an extent that trading in Bombay Stock Exchange’s benchmark Sensex was halted briefly .Realty, oil & gas, banking metal and capital goods counter were the worst hit in today trade and the midcap was also badly hit.Since amongst the badly hit funds , realty funds were also their the India real estate market is also in question.With the fears of recession in the US, the Indian real estate market might also see a slum.Can anyone predict that.What affect this bloodbath at Dalal Street will have at Indian Real Estate Market.Expert comments are welcome. Innovation – The need of the hour. People who are marketing their products are fighting hard to promote their brand and prove it to be better than competitors. In every sector the customer looks in for much more than what was being delivered last time to them. There is always a demand for something new. That’s the reason why every marketer is busy exploring new things and trying hard to be an opportunist. The Indian real estate market has also seen such types of situations where real estate developers have tried and tested new techniques for marketing their product. The new marketing strategy followed by Mr Sumit Dabriwala, a Kolkata-based developer is a good and a new step which no other developer has done so far. He has collaborated with Home Solutions Retail (a Pantaloon Retail subsidiary). FH Residences is the joint venture named as. Mr Sumit Dabriwala is looking to market its 2 & 3 bed-room "walk-in" apartments through Future Group stores such as Big Bazaar. Home Solutions Retail will provide the brown and white goods required to furnish these apartments. FH Residences is also looking to advertise its apartments in Future Group malls. Is their any new thing which you have come across in the industry, then please share. The tier III and IV cities have been demarcated based on per capita income levels, infrastructure, and population base. These cities are state capitals and other commercially important cities that are experiencing improving quality of life, infrastructure thrust, and positive economic sentiments. The improving economic conditions have impacted the demand for residential, commercial, entertainment and hospitality sectors and this has led to considerable alteration of the real estate landscape of these cities. The change has attracted many national as well as foreign developers to these small towns to offer lifestyle-oriented services and products. While the residential sectors in these cities are on an upswing, most of the smaller towns are yet to have an organized or defined office and retail market. Chennai the fourth largest metropolitan city in India is a major trade centre, well linked by road, rail and air to important cities besides being a seaport. Dubbed once as a sleepy and slow-paced city for long, it is today abuzz with activity in business, industry, entertainment and leisure. Big names like Ford, Hyundai, Hindustan Motors, TVS, Ashok Leyland, MRF, etc.opted for the city. Recently, BMW has opted for the city to set up a car assembly plant at the Mahindra City and Hyundai has decided to put up a second plant near its existing facility on the outskirts of the city. Leather, biotechnology, floriculture, horticulture and construction industry are the potential growth areas in the state in future with IT industry. Chennai has traditionally been the hub of economic, geographic and political activities of south India. Its economy is well balanced with the info-tech , entertainment, industrial and other service establishments playing equal role in city's growth. Unlike other metros, there was no significant steep rise and fall of the real estate market in the post liberalization era in Chennai. This was due to the fact, that not many multinational companies had chosen Chennai to start their operations. It can be attributed to the large floating stock available in the market during this period. Chennai has several inherent advantages for real estate development, availability of skilled manpower, better infrastructure and cosmopolitan outlook. The all-round development has excited many national & international real estate developers to enter the Chennai property sector.There has been upsurge in demand for residential apartments and property. The spillover effect is felt in suburbs as well with developers focusin more areas for residential property development. Chennai is rapidly growing towards the southern and western quadrants, with high demands of residential apartments in Abhiramapuram, Adyar, Boat Club Road, Kalakshetra colony, MRC nagar, Nungambakkam, Valmiki nagar, Velachery, Old Mahabali Puram. Properties offering world class lifestyle amenities are mushrooming across the city. Chennai will soon have its first integrated and large-scale community at Old Mahabalipuram Road (OMR). The Chennai project will be developed under a new brand name - Hiranandani Upscale. A 110 acre-premium project that is expected to redefine the concept of urban living. Upscale offers 2-4 BHK apartments housed in 6 Stilt+28 storied towers. 2. Expenditure: By inducing expenditure on services/goods that would induce more expenditure in related areas which would cater to the process of diverting money into sectors that would eventually generate returns through the trickle down theory. 3. Price Rationalization: Black market may induce people to relook at prices. If a product is supplied at a certain price through a controlled mechanism and if the product is available at a cheaper price in the black market, it may play a role in stabilizing the prices. If let say people evade octroi, and use black money or a bribe to get away, one may consider whether the amount of octroi incurred is reasonable or not…..
Just because of the black money being spread across the Indian real estate market its always advisable to consult a good and well renowned Real Estate consultant like Axiom Estates.A real estate agent will guide you to - and through - the most important decision of your life.Choosing a real estate agent falls into the same bracket as choosing a medical doctor or a lawyer. Axiom Estates is the premier India Property Service Provider Internationally. We work closely with all category A developers in India to offer the most comprehensive range of Prime new property developments in Tier I or Tier II cities. AxiomEstates offers the largest range of New Property Developments across India in Mumbai, Delhi, Bangalore, Kolkata, Goa, Pune and more. Forecasting future is called speculation. In real estate business forecasting on future property prices and cashing on it is profitable and it can be risky too. Extra caution is required from the beginner’s end. Taking advice from other investors and well renowned Real Estate consultants will also help minimize mistakes. Following tips can help in going smoothly. If you are planning to invest and speculate for a higher price then need to look around the neighborhood of the property you are investing in. Try to find out if any development in near future could hike the value of the property. Think of buying the property only if you want to hold for an indefinite period. Plan wisely. Weigh the risk and calculate profits deducting all the taxes and fees that you would have to pay until the property is all yours. Resist temptations of selling it early at the rise of prices. Do not wait for the price to rise to the highest point. If possible go for investing in distressed properties such as pre-foreclosure homes, or foreclosure homes, and so on. Always try buying multiple properties that are cheap instead holding on to one and wait for its price to escalate. Being a novice, do not go for pre-construction buying. Supposing the construction does not take place at all or is stopped half way through you would be in a dilemma. Do not go for rumors in the market. Because at such times you may commit mistakes by selling good deals and keeping bad ones for bad times. Learn to bear small losses for big gains in future. Don’t take big risk for small profit. Selling when the markets are inactive may prove a big loss. Go by the trend rather than blind speculation. Always be handy with finance. You may miss the opportunity of getting homes at reduced prices. When the markets are going against your prediction try not to ride on your emotions but plan with good defense. Don’t go on the stories because sometimes the market negates them. Money management always helps at odd times.